Note: Anyone can type on the internet making unverified reviews of a company and through their own perspective (as you know there are millions of people 1 out of 6 statistically on psychiatric medications: Anxiety meds , depressant meds , psychosis meds and many people are very miserable). Many competitors hate my success as a company – their hateful intentions cause them to leave fraudulent reviews on sites that don’t require any PROOF e.g. ripoff report , yelp , even the BBB doesn’t require any proof of a review (BBB even tries to get companies to pay $650 a year to be credited in the attempt to exploit small companies. These sites love anyone posting because its free blogging on their review site that ultimately makes them money for advertisement. These typical review sites that so many people believe in , actually seek no validity before submissions. Matter of fact some Lawyers unethical behavior post fraudulent negative reviews so then the company has to hire them for reputation service to remove the unverified review. 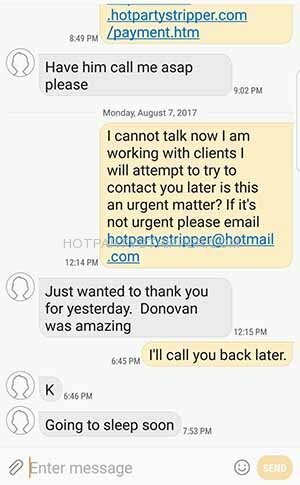 Here on Hot Party Stripper reviews we show you some valid text messages, pictures as well, videos cant be photo shopped and Sean Michael’s the owner’s resume as winner of USA strip off twice, winner of PLAYGIRL man of the year, Hawaiian Tropic man of the year, 30 minute interview on Entertainment Tonight, Deco Drive winner and judge in 2016, model for various major agencies and magazines, on over 100 TV show episodes last being Jillian Michael’s show on the E-channel speaks for itself as a credible owner of a nationwide exotic dancer company. Here, you will see some video and pictures of celebrities that don’t mind confidentiality of this stripper service. 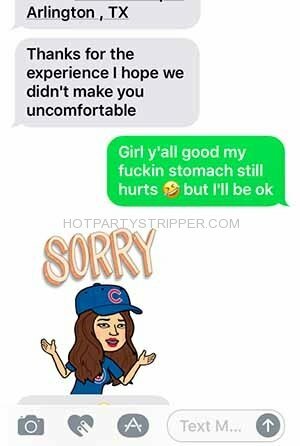 Some hotpartystripper reviews have been made below as well indicating the fun service that was provided. Understand many people will not post there review online either because of the type of business this is. Great speaking with you today. I am excited to be working with you for the surprise party Jillian Michaels is planning for her in-laws! As we spoke about, this is for Monday October 10th, (3) male strippers in the costumes discussed. (Caterer, Golfer, Officer). This will take place at a private residence in confidential. Keep me posted on the booking in case anything comes up with one of the dancers. I like to weigh on the side of backups! The success of this party relies on the awesome stripper revu. Attached is our standard appearance release which everyone who appears on camera is asked to sign. Let me know if you have any questions. I will have these with me on day of as well to sign on site. In terms of scheduling for that day, tentatively I would like to meet with your team around 4PM and have them on standby to make the surprise run smoothly. I will follow up with an exact timeframe and where to meet so you can plan accordingly. 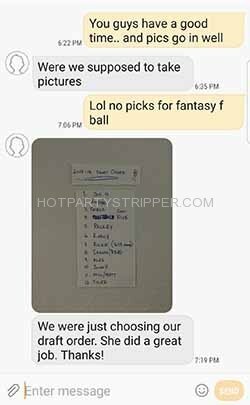 Let’s also look into (1) female stripper gram for Sunday 10/4 in The confidential material as we spoke about. I will keep you posted on where that would take place based on the public area. I would rather book and call an audible on where that takes place once we can scout. Do not hesitate at all to call my cell at any time or pass it along to anyone who may have questions. I will be there the whole way through to make sure everyone has what they need! We are 100% a go for the booking and I look forward to working with you! He was awesome! Such a sweet heart and did a fantastic job for my sisters Bach party! Had everyone going and had the party going ! Love him his a sweetie pie! 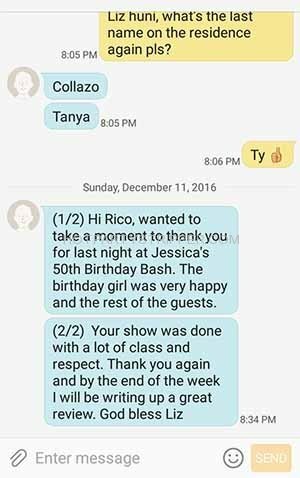 Thanks Rico ! I would just like to say me and my friends hired Fast Eddie for my birthday party last week and not only was he better looking than I could ever imagine but he was very professional and I could tell he took pride in keeping all of us happy. He was very talented with lots of professional moves and who knew just the right touch to make everyone happen O on top of that he had us all laughing and smile from the moment he entered to the moment he left.Hands down he was the best performer I have ever seen I totally advise any women planning any occasion to definitely book Fast Eddie. Thanks Alina for the kind words and taking the time to make this review. Fast Eddie is one of the favorites in New Jersey. 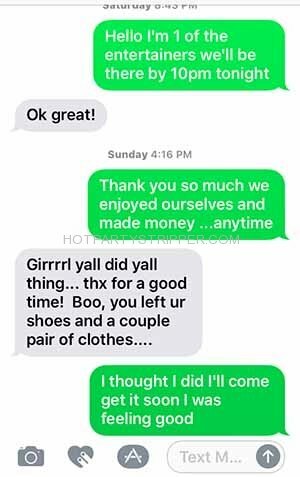 We are happy you liked our recommendation and that you girls had a great time. We will definitely use Sean and the girls again. Thank you and I will highly recommend you always! 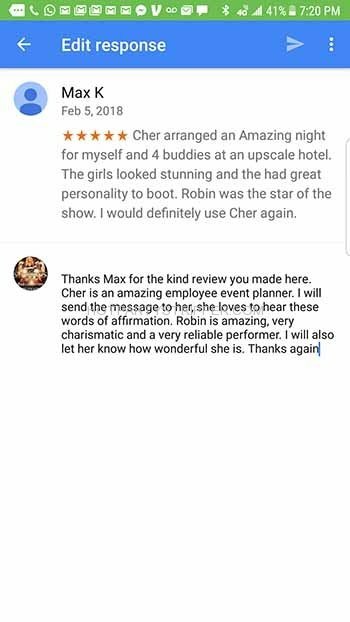 Cher, thanks so much for setting up our bachelor party and bachelorette party here in Austin Texas. We all had a wonderful time separate by a duplex house we rented. We were competing for who is louder LOL. 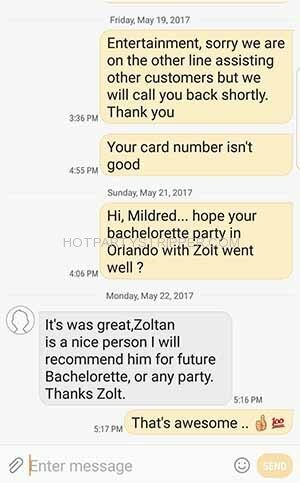 The entire experience was wonderful and looking forward to another great party. My girlfriends surprised me with Brandon for my “Dirty 30” in Orlando. He surpassed any expectations I had. He was polite, funny, and had a smile that made me melt immediately. His dancing was not polite, and I loved every minute of it. It’s not easy to make someone feel alone with you in a room full of people. He has incredible talent. 10/10. Truthfully, we’re already planning an excuse to hire him again.